The piston seal is there for the purpose of keeping the brake fluid from escaping when the piston is moving in its bore. It also springs back the piston to a retracted position. The piston boot serves the purpose of keeping dirt and debris from the bores of the caliper. Subject to excessive heat –particularly in carbon ceramic applications, where the pad temperature rise to a peak of 1500 degrees- the piston boot usually has a tremendously high thermal resistance steel ring found within its manmade EPDM rubber assist to hold its shape. There are six of them: three for each side. 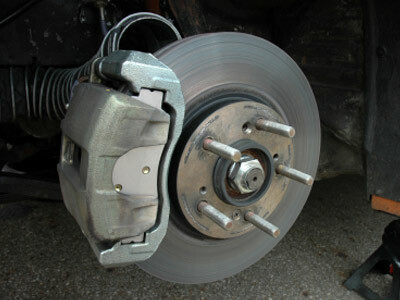 They force the braking pads to touch the rotor. These pistons are small on the leading edges but grow bigger towards trailing edges to balance the force of pressure as well as the heat exerted on the brake pads. Balancing the force of pressure is very significant to the pad wear, keeping them from cracking or tapering. The uniform wear of the pad and the pressure also benefit the pedal feel. To reduce the pedal travel as well as provide the most constant feedback it is necessary that all pad areas touch the rotor at exactly the same time. The stiffness of the caliper is also very significant to the pedal feel. What is referred to as the bridge is actually a chunk of a casting which keeps the calipers sides from being spread open by the pressure.